Attacks against women's dignity and safety at work and in society are widespread and growing, and few governments or employers are willing to take adequate measures to stop it. It is therefore urgent that unions actively support the call by the United Nations' Special Rapporteur on violence against women for a universal legally binding instrument at the United Nations level. 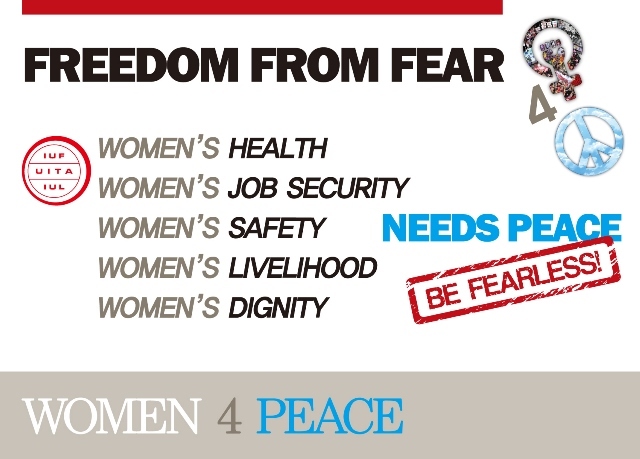 On International women's Day 2015 IUF affiliates in the Asia/Pacific region are mobilizing under the banner 'Women for Peace' in response to the resurgent militarism in the region and a militarization of politics that threatens democracy and further undermines the position of women and the fight for equality. A resolution adopted by the UN Security Council in October 2000 noted the increased targeting of women and children in armed conflicts. The resolution highlighted "the important role of women in the prevention and resolution of conflicts and in peace-building" and the need to fully involve women in decision-making concerning conflict prevention and resolution. Fifteen years later, the strategic use of violence against women has expanded, while a majority of women remain excluded from any influence on conflict prevention measures. Gender-based violence is still relegated to the 'private sphere', ensuring that few if any resources are devoted to stopping it and to involving women in key decision-making processes. Decades of soft law and 'voluntary initiatives' have failed to bring about what the Special Rapporteur calls "appropriate responses and also accountability for acts of violence against women, which is acknowledged as a widespread and systematic human rights violation." This will continue as long as governments are not prepared to tackle the root causes of gender discrimination and enforce laws, policies and programs that truly promote gender equality. Unions have a crucial role in continuing to fight for women's human rights, dignity and safety at national and international level. There is still no ILO standard specifically dealing with gender-based violence at the workplace. The ILO's governing body last year twice postponed a response to the Workers' Group call to place gender-based violence on the agenda for a standards setting process. This year, while we continue to push to bring violence against women onto the collective bargaining agenda, and continue the fight against all forms of gender-based discrimination, we must organize to make sure that the cry for equality is finally heard and translated into global standards, beginning with the ILO.